Shannon Briggs says he's been in talks with Warren for a fight with Fury; says he's nobody's tune-up! Shannon Briggs says he’s been in talks with Warren for a fight with Fury; says he’s nobody’s tune-up! Shannon Briggs has taken to social media (again) to announce how he has been in talks with promoter Frank Warren regarding a bout between he and the possibly set to return Tyson Fury. It goes without saying that absolutely nothing is close to close to concrete as far as these two great talkers are concerned (will Fury ever fight again? Will Briggs get a license to box in the UK himself?) but Briggs is eager to be the first man Fury faces upon his will-it-won’t-it-happen comeback. Briggs, adding a doctored photo to his Instagram babble, sorry, message, in which he is pictured standing over a fallen Fury, says that he is no-one’s tune-up and that he will punish Fury if and when they fight. What is it Mike Tyson once famously said: ‘everyone has a plan until they get punched in the mouth!’ But can Fury get himself back in shape, get a license and be able to punch anyone in the mouth? Briggs is sure hoping so. 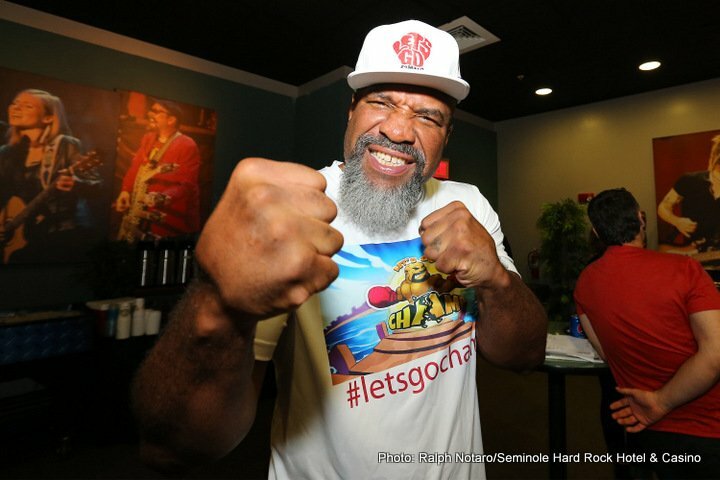 You are here: Home / Boxing News / Shannon Briggs says he’s been in talks with Warren for a fight with Fury; says he’s nobody’s tune-up!